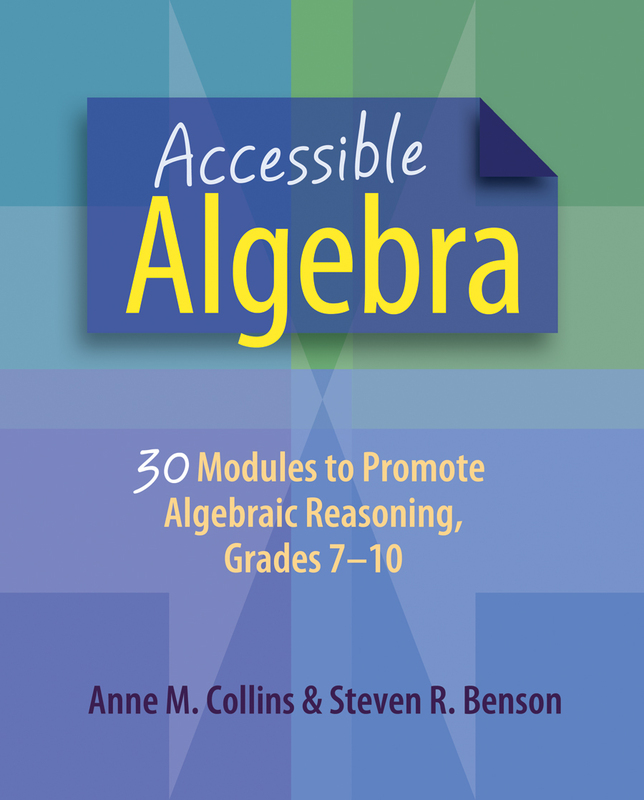 Accessible Algebra is for any pre-algebra or algebra teacher who wants to provide a rich and fulfilling experience to students as they develop new ways of thinking through and about algebra. Each of the thirty lessons in this book identifies and addresses a focal domain and standard in algebra, then lays out the common misconceptions and challenges students may face as they work to investigate and understand problems. Anne and Steve met with and listened to students in real classrooms as the students explained what problem-solving strategies they were using or worked to ask the right questions that would lead them to a deeper understanding of algebra. The authors describe these classroom scenarios in each lesson and also suggest ways teachers may assign a problem or activity, how to include formative assessment strategies, and suggestions for grouping students. Each lesson also includes sections on how to support struggling students, as well as additional resources and readings. Anne Collins has thirty years of teaching experience, having taught all grade levels K-12, as well as undergraduate- and graduate-level courses. She has been providing mathematics content professional development institutes and courses for teachers for the past fourteen years. Steven R. Benson is a mathematician and mathematics educator at Lesley University; he has created curriculum and facilitated professional development for pre- and inservice teachers for nearly thirty years. He was the lead author of Ways to Think About Mathematics: Activities and Investigations for Grade 6–12 Teachers (Corwin 2004). This is an amazing book that I wish had been available when I was first teaching algebra. The NCTM effective teaching and learning process standards call for tasks that promote reasoning and problem solving. These expectations make this book essential for all algebra classrooms.